star is anything like Marvel character. 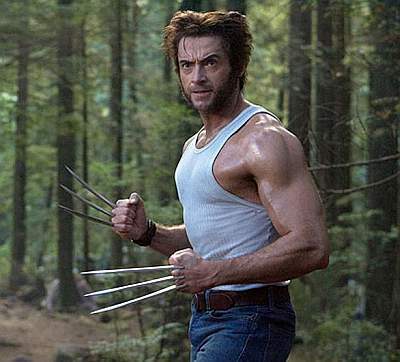 Speaking on 'The Late Show with David Letterman', Hugh said: "He never talks to me about 'Wolverine'. He never admits it's cool, he never admits, 'This is great,' nothing like that. "In fact a friend of his was saying how cool and he goes, 'Trust me, my dad is nothing like Wolverine, he's not tough, he's not cool in any way.' "
Deborra-Lee Furness - jumped at the idea of joining him to watch the movie at 7am. He explained: "I had to see the movie at 7am and I said, 'Oscar, I'm gonna see 'The Wolverine', I have to watch it in the morning.' Now this is summer vacation, there is no 7am for a 13 year old. Six o'clock in the morning, he was up, waking me up like 'Dad, is it time?